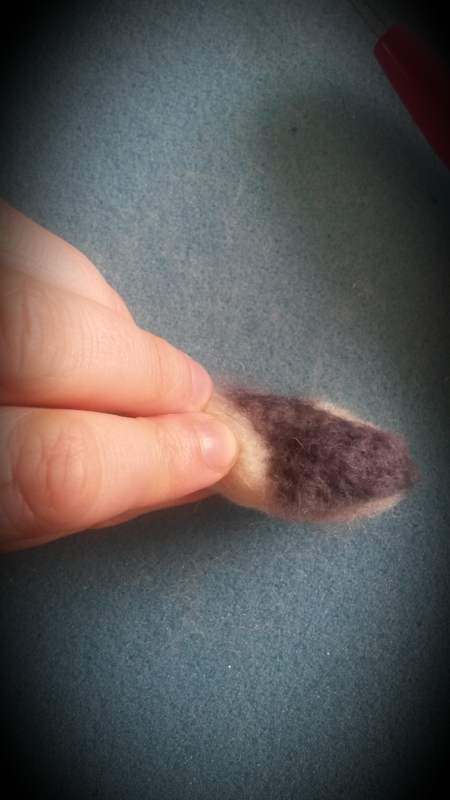 I am very excited to present to you my greatest needle felting challenge yet. He is modelled on a beautiful young Shetland sheepdog (Sheltie) called Schubert (Schubie)! 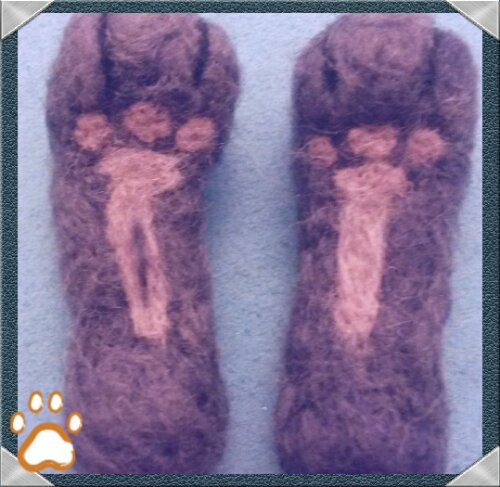 The real dog is very much loved by his human mum and dad and his dad wanted a surprise gift for his wife (Schubert’s mum) for Christmas! 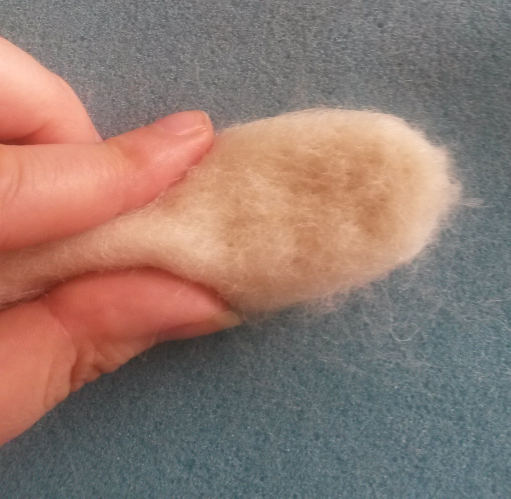 Schubert has so many tones to his luxurious fur so I spent quite a bit of time blending wool colours. 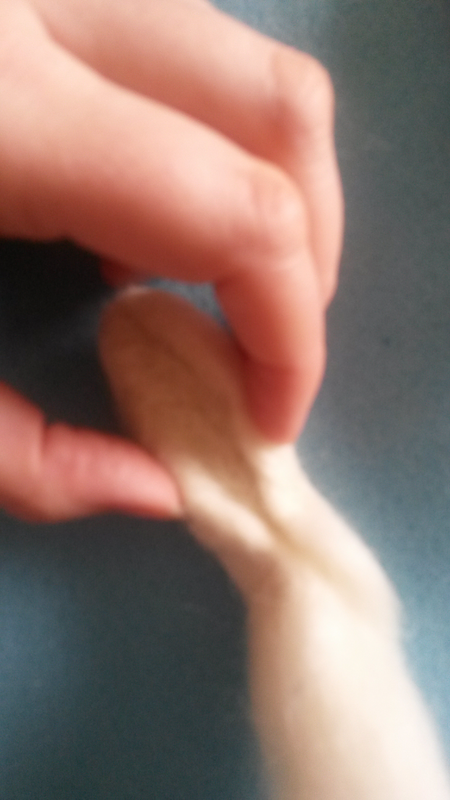 He also has very long fur so I really put into practice my ‘adding long animal fur’ techniques. 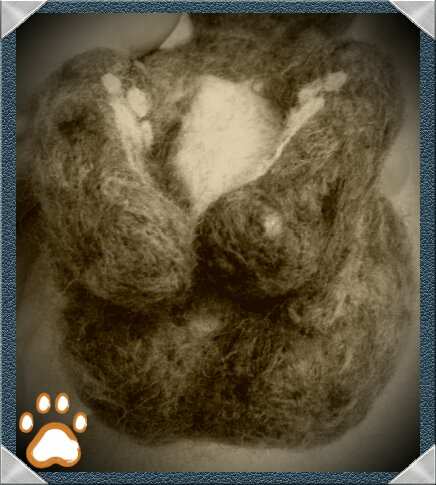 I started off wrapping corriedale core wool over a wire armature. 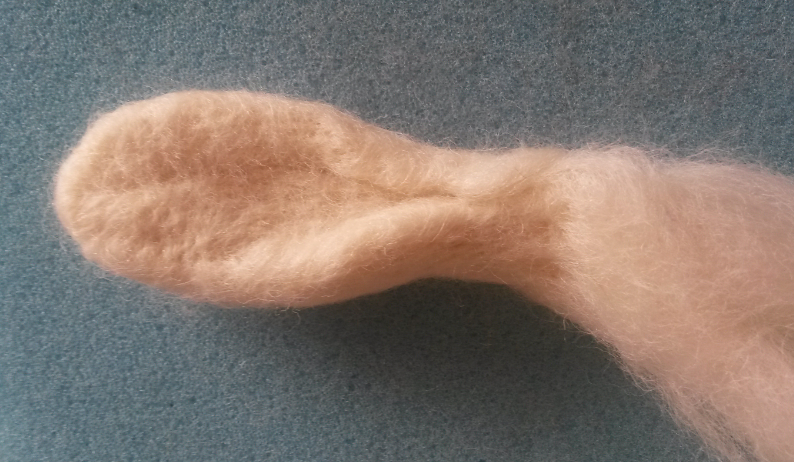 Then I added paw pads and then some detail on his face before starting on his belly fur and working from his tail end towards his neck with merino wool. I did his wispy feet hair and tail last. Please see the work in progress videos for more info. 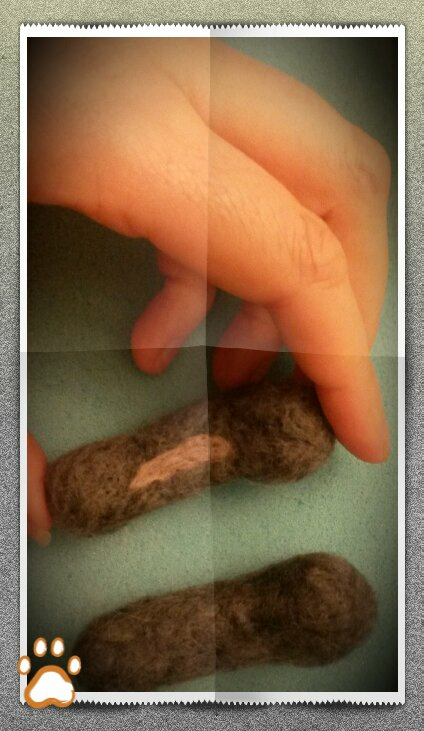 In an attempt to keep him as authentically ‘Shetland’ as possible I managed to include some brown Shetland sheep wool in his coat and his whiskers are made of black Shetland pony tail hair all the way from Scotland. Here are some photos and a short video. I hope to get some photos of him and the real Schubie together soon too! Posted in Needle felt and tagged art, dog, dog sculpture, felted animal, needle felt, Needle felted animal, needle felted dog, puppy, sheltie, shetland sheepdog, wool. Bookmark the permalink. 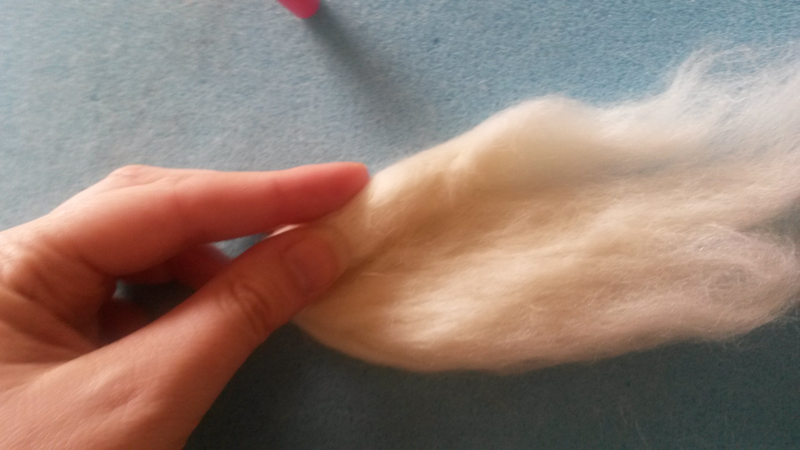 How to needle felt long animal fur; the video! 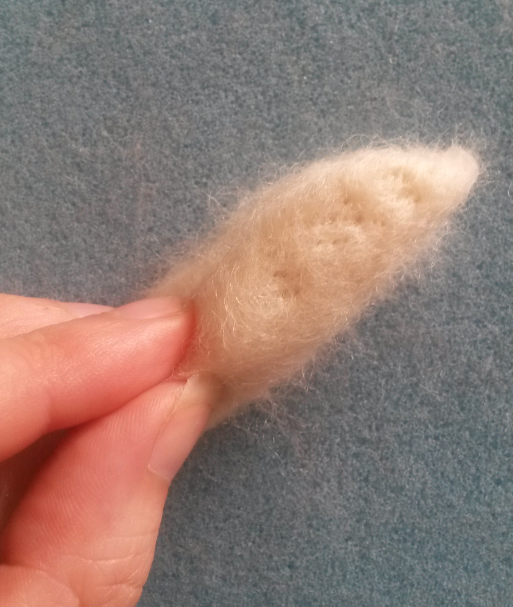 Would you like to watch techniques for creating a detailed and realistic long fur look on your needle felted animal? 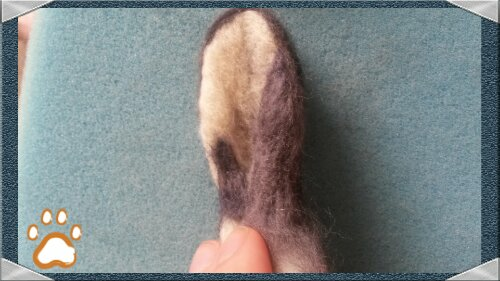 You have likely seen my photo tutorial with basic techniques for adding long wool fibres onto a badger. Well here is a video for those who learn best by watching how it’s done. This is far more in depth with more techniques and tips along the way! Difficulty ranking: Intermediate level or beginners looking for a challenge. 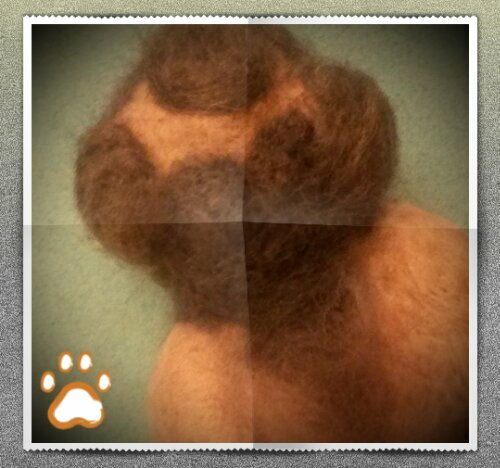 The result: Amazing detail; the look of a real animal with layers of fur. Chapter start times for easier video navigation. 1:00 Overview; what techniques will I learn? 12:03 What tools do I need? 38:10 How firm should the core wool be? Why not get your own copy today? 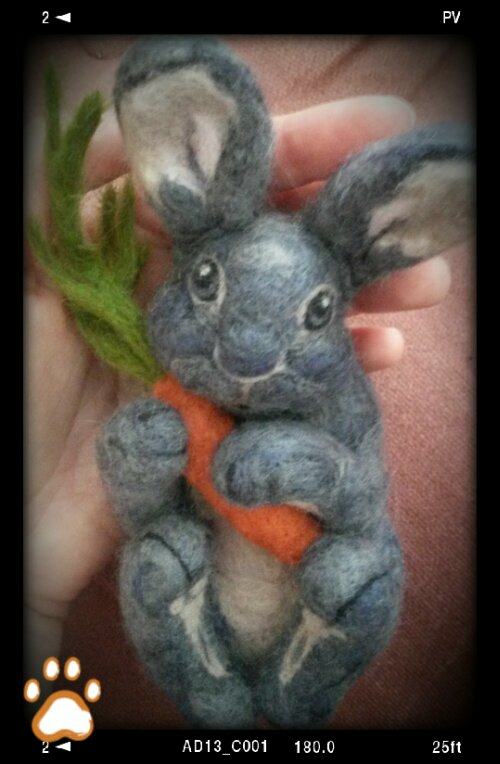 Don’t have time to make one but would love a one of a kind needle felted animal by Fit to be loved for yourself or for that special someone? Visit my Etsy shop today to see my latest creations. Or like my facebook page to see what I am making next. 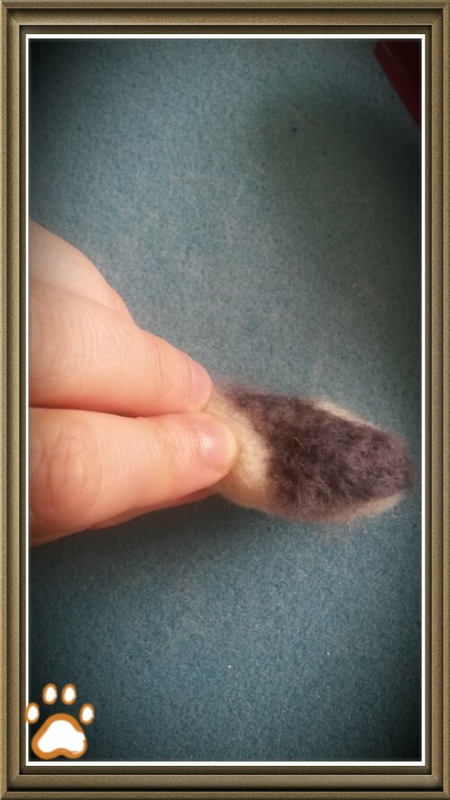 Posted in Needle felt and tagged felt, felting, how to, long fur, Needle felted animal, tutorial, video, wool. Bookmark the permalink. How to make an Easter bunny! 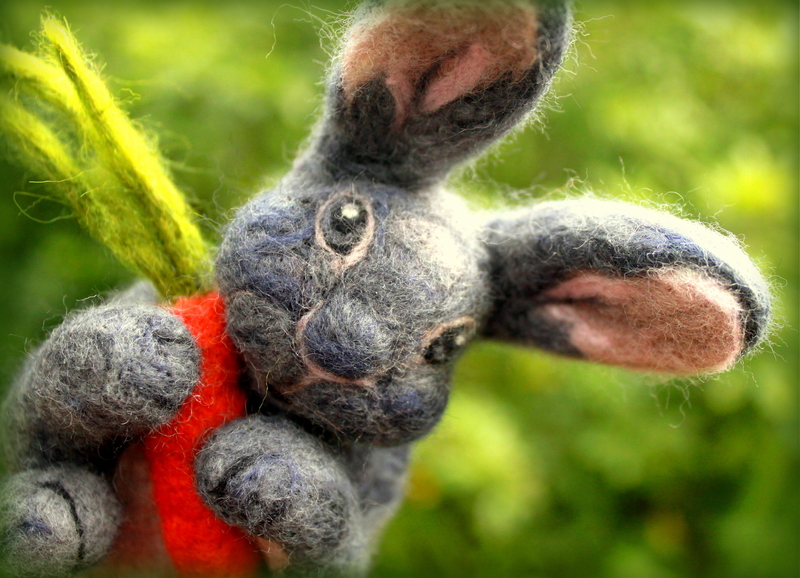 Want to know how to needle felt a bunny this Easter? How about bunny ears? … need some ideas to get started? 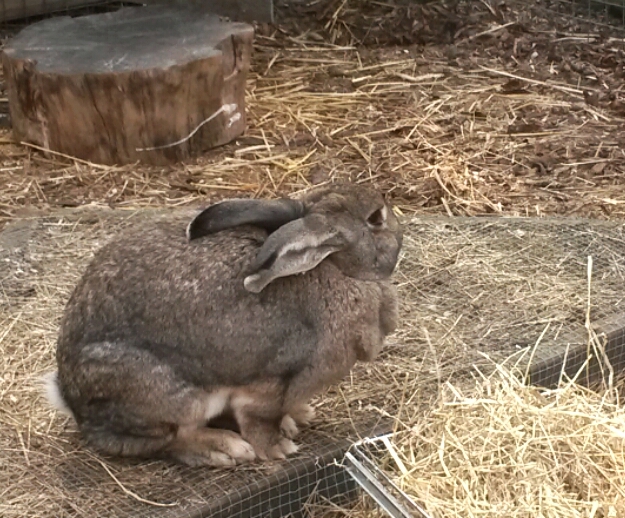 The other day I visited Vauxhall city farm in London (which I sometimes visit on my lunch break from managing the National Bat Helpline) and took a few snaps of a rather large bunny (I think he is part Flemish Giant) but he looks like a wild bunny with all that browney-grey fur and as you can see he is well camouflaged too. 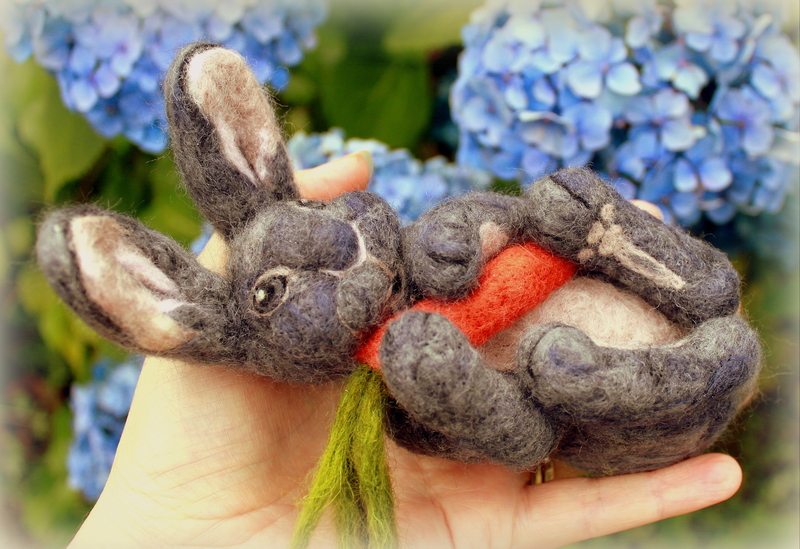 It got me thinking and I am sure you will agree that bunnies are a great sign of spring and new life at Easter and like the Vauxhall one they are extremely cute and well worth taking the time to admire. I do of course also love to eat chocolate bunnies (yum) and can’t wait to finish my Lent no chocolate diet to get my teeth into one! 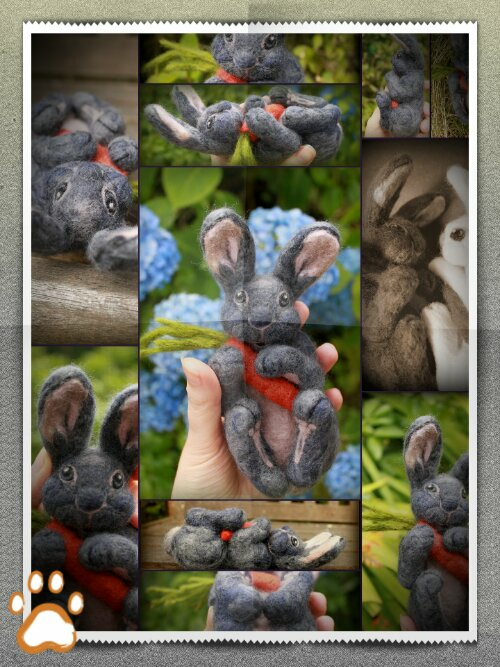 So how about making a bunny this Easter? 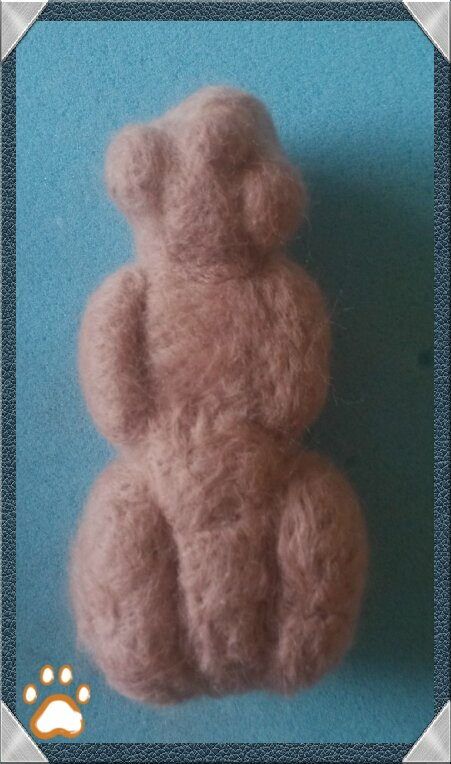 The first time I bought some wool and attempted needle felting I ended up making this little cream bunny from corriedale wool. 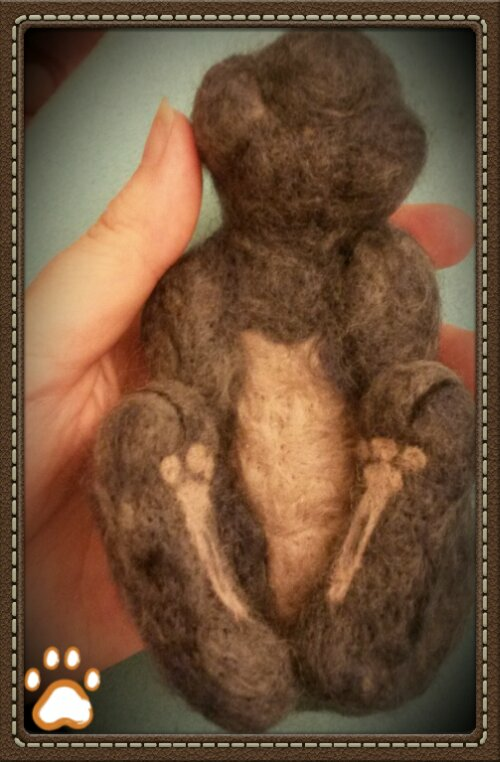 Then soon after I was commissioned to make a gorgeous grey bunny for a colleague who wanted to surprise his wife for her birthday. 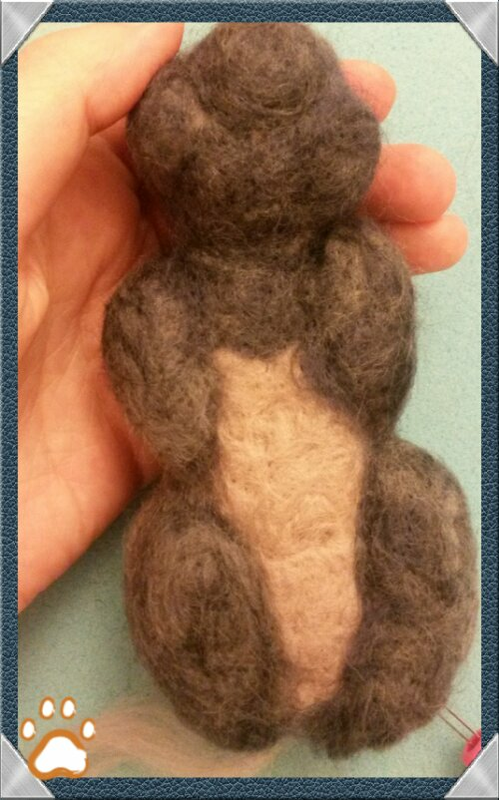 His core is corriedale and grey and pinky fur is of merino wool. 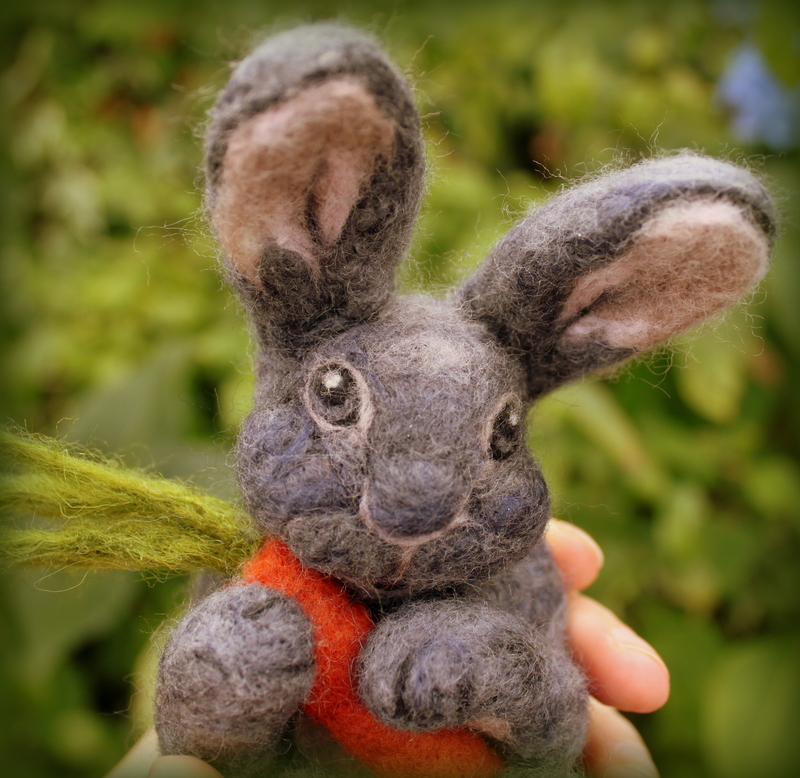 To make a bunny like these yourself this Easter why not click here to try out my needle felted bunny tutorial. 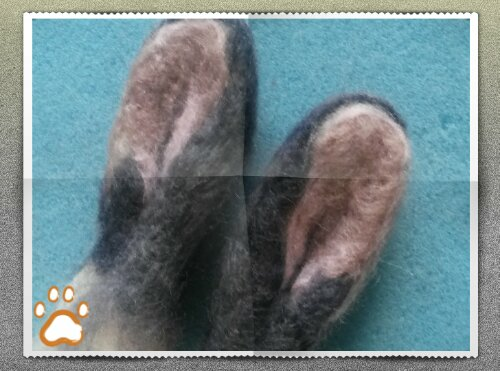 ….and for more detail on making those lovely long ears click here. 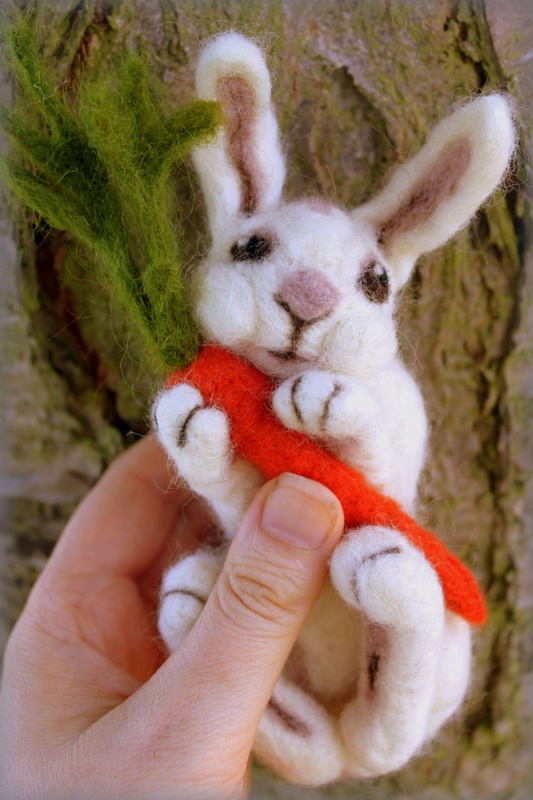 I gave my bunnies a carrot to hold but what about keeping with the Easter theme and placing your bunny in a basket holding some needle felted eggs like the one below ? 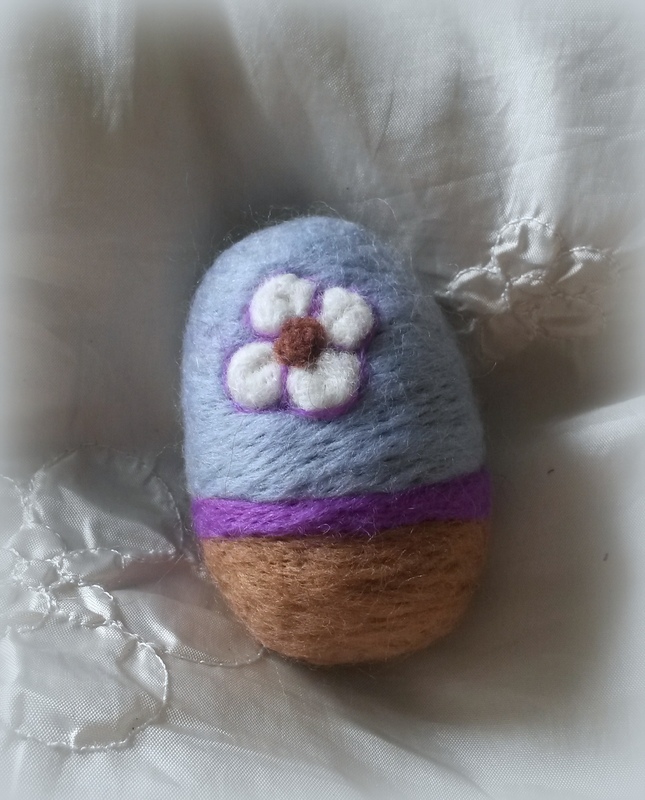 You could wrap wool round wire and needle felt the wool in place to create stems and add simple flower heads like the one I made in this tutorial. 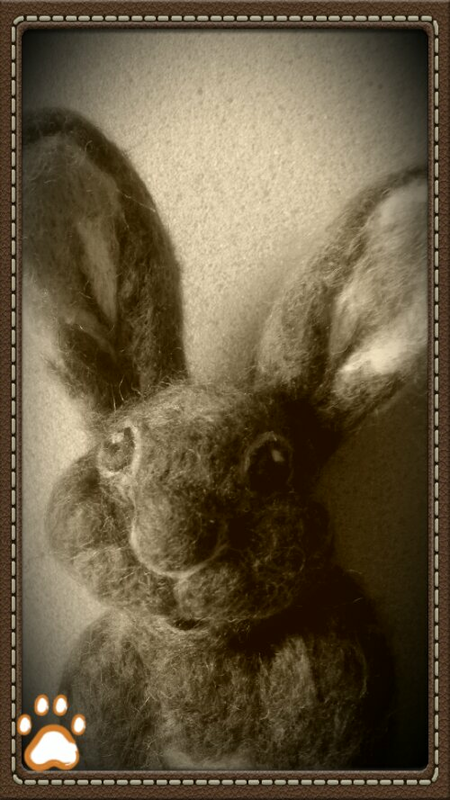 Or why not try a sitting Easter hare?? 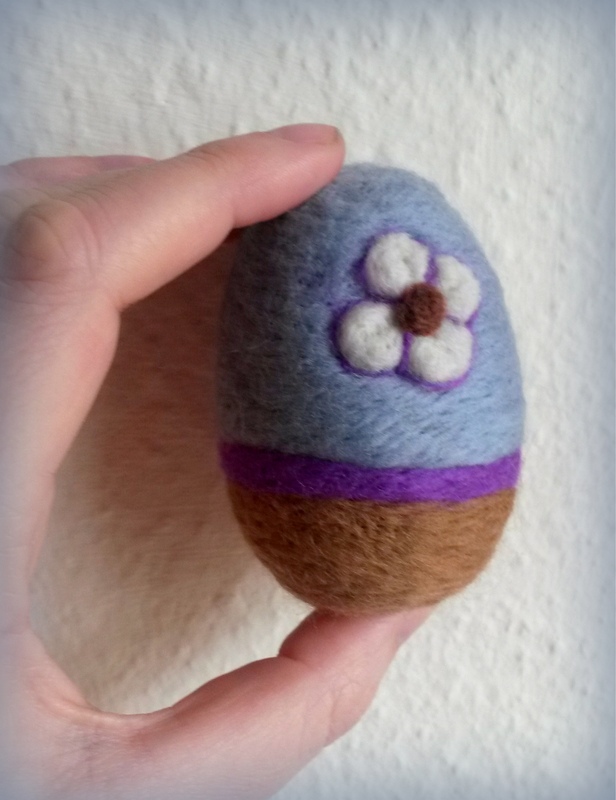 Posted in Needle felt and tagged bunny, Bunny ears, Easter, Easter bunnies, easter bunny, easter egg, felt flower, felted bunny, needle felt, Needle felted animal, needle felted flower. Bookmark the permalink. 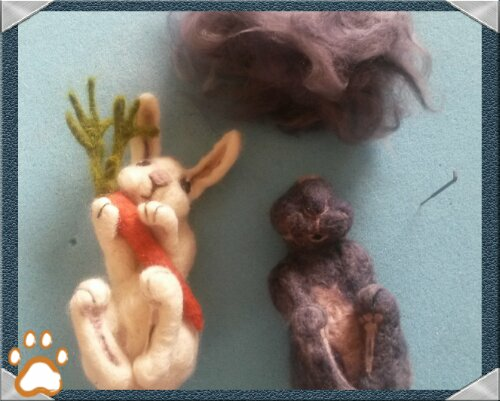 Today I just want to share some photos with you to give you a taster of the various stages that went in to needle felting my latest bunny. I haven’t photographed everything but stopped at various times along the journey to take a shot. 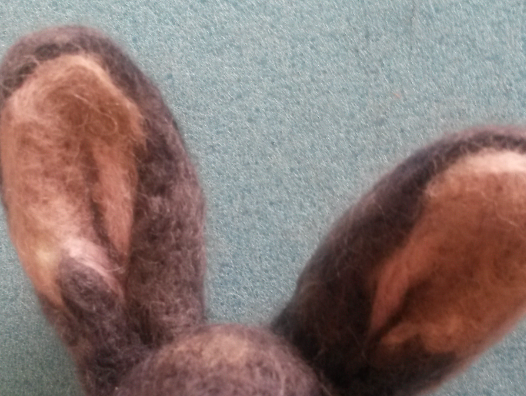 Please also see here for more detail of how I made his ears. It doesn’t matter too much about what order you add each limb or ears or facial features. It is fun to experiment with different ways of doing things. You will soon find out what works best for you. I have found though that whenever you add the eyes your creation immediately gains personality and you also get a tiny break from all the time consuming needle action. I love doing the eyes and ears best. 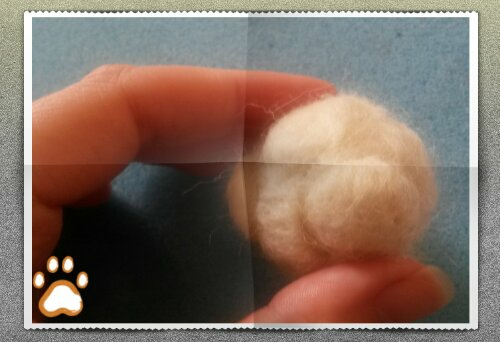 Basic ball to start for bunny head. Core corriedale wool. 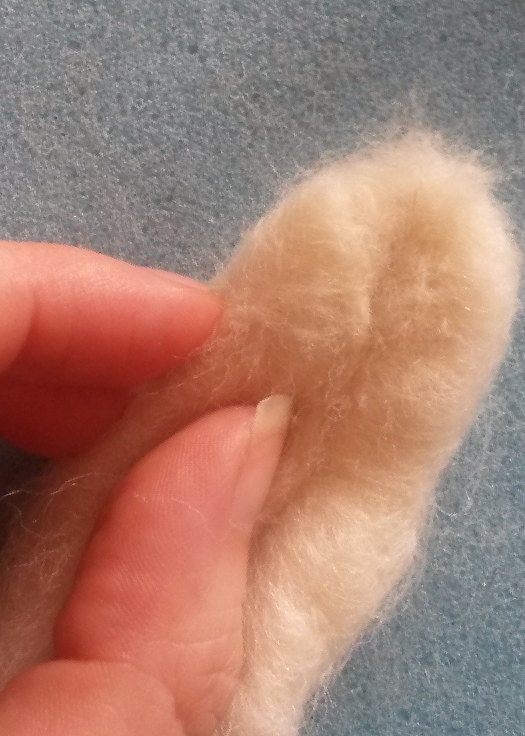 Additional layer in mink coloured merino wool to form base fur. 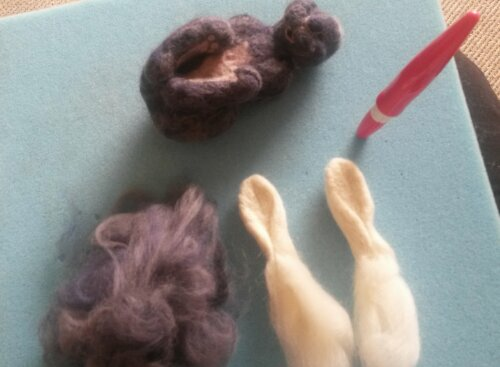 Blue and grey merino wool mixed then shallow felted to become bunny fur. Leaving his tummy in mink. Forming ears. See more about making ears in a tutorial here. Front paws and holding a carrot. Adventure for bunny in the garden for nature’s backdrop! 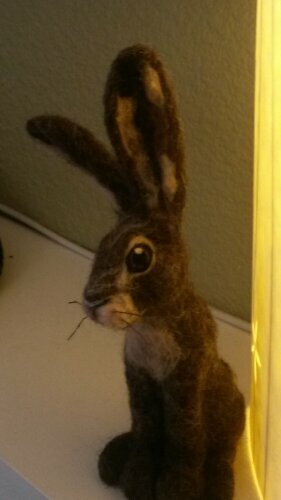 To see more pictures of this cute bunny and to order one as a gift just like him for someone you love, please visit my Etsy shop. To follow my blog and receive email updates about latest fit to be loved creations and tutorials, simply enter your email address on the top right panel of my ‘find out more’ page. 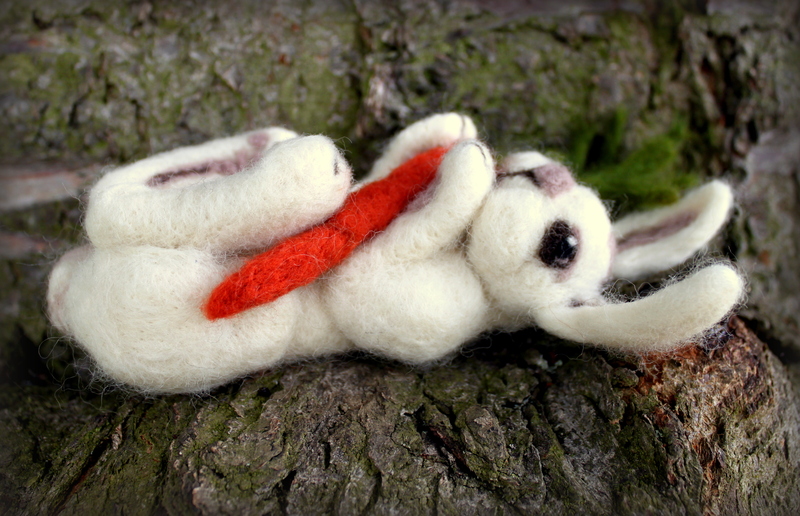 Posted in Needle felt and tagged bunny, Easter, felt bunny, felted bunny, felting, felting tutorial, handmade, Needle felted animal, needlefelt, rabbit, tutorial. Bookmark the permalink. 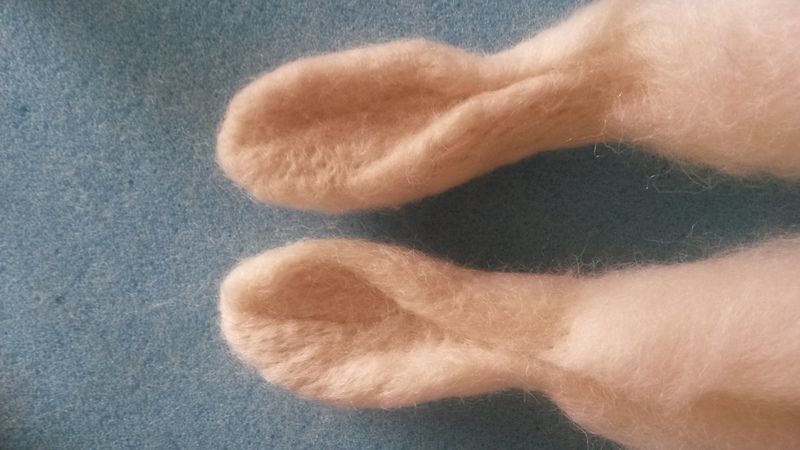 How to needle felt bunny ears! 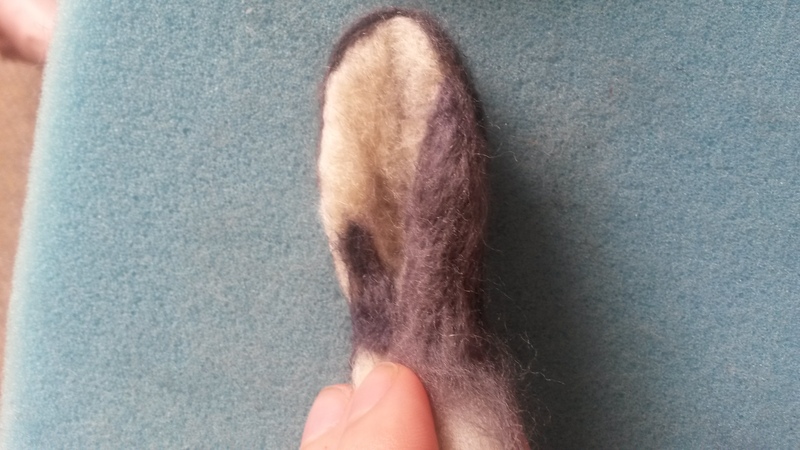 Now that I have revealed my latest needle felted bunny in my most recent post, I can share with you how I made his cute bunny ears. The real bunny, owned by Pete and his wife, had the most incredibly gorgeous long ears and I really wanted to take the time to detail their every curve and beauty. As I created them I took pictures at each phase to document how I made them for my own reference when making other ears in future and also to share with you now on my blog..
For those of you who have some experience of needle felting I am sure you have your own preferred technique but please do take a look – your ideas are very welcome as I am still fairly new to this and so far it has been trial and error but most enjoyable. For those who haven’t tried yet , I hope this inspires you to have a ‘stab’ at it! 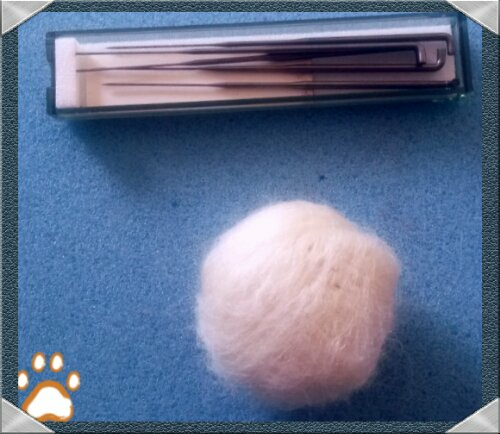 This is specifically to show you how to create ears for the bunny I made above, but some of the methods are very similar for other animal ears so feel free to follow them for other projects..
A needle holder; this is optional but for making basic shapes it saves time to use 2 or 3 needles at the same time. 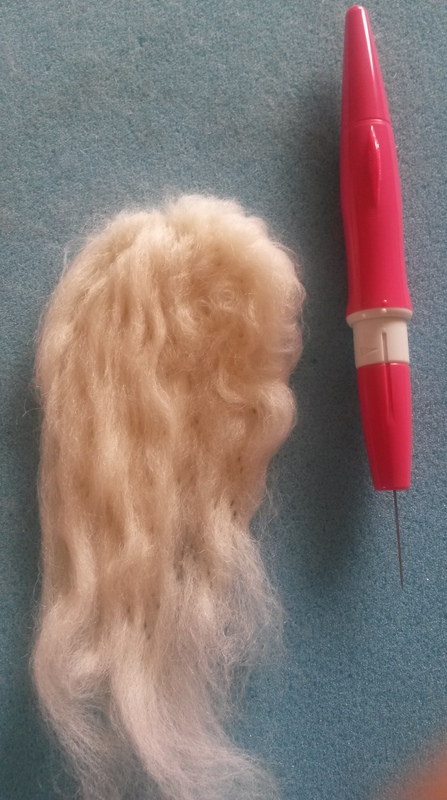 In the pictures you will see I use the 3 needle holder pen by Clover. 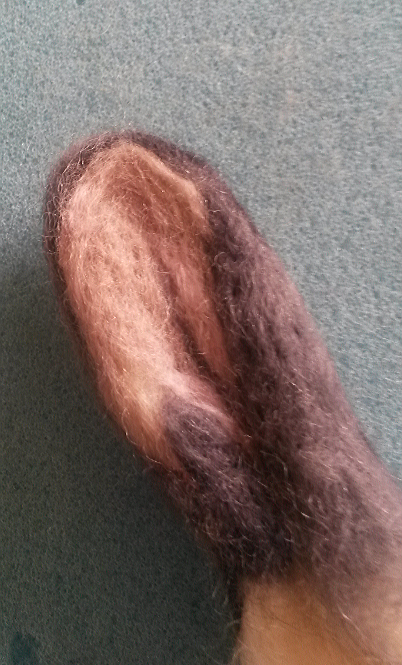 Wool to felt with; I used natural corriedale wool to make the basic ear shapes as I find it felts well and ends up nice and firm (especially to keep in alert bunny position). 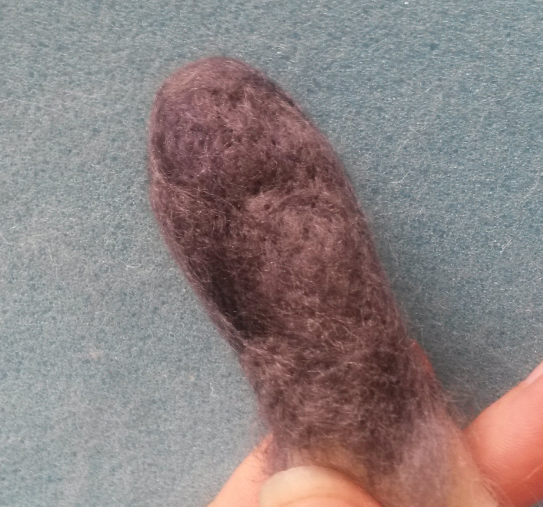 I then used merino wool as the top coat as it’s soft and comes in some lovely animal fur colours. 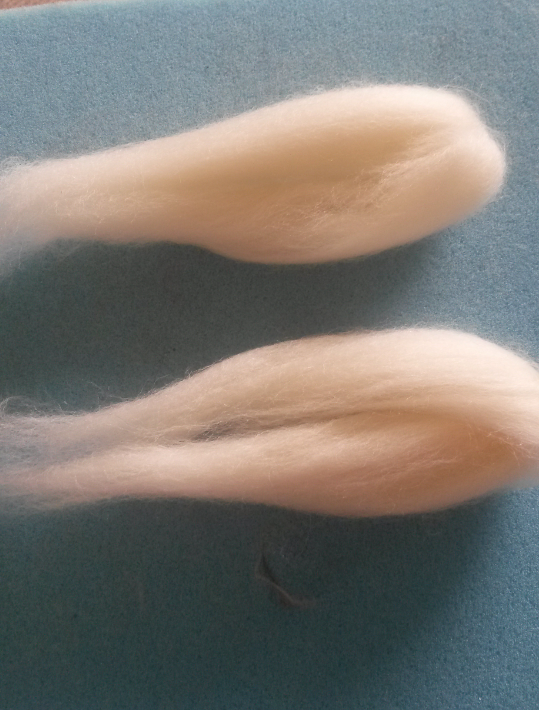 I buy my wools at a very good price from World of Wool. So…. on to the tutorial! By the way….. the point at which I am about to felt the ears I will already have my head sculpted, I can then at any time measure up the ears to the head to ensure I am getting the right proportion. 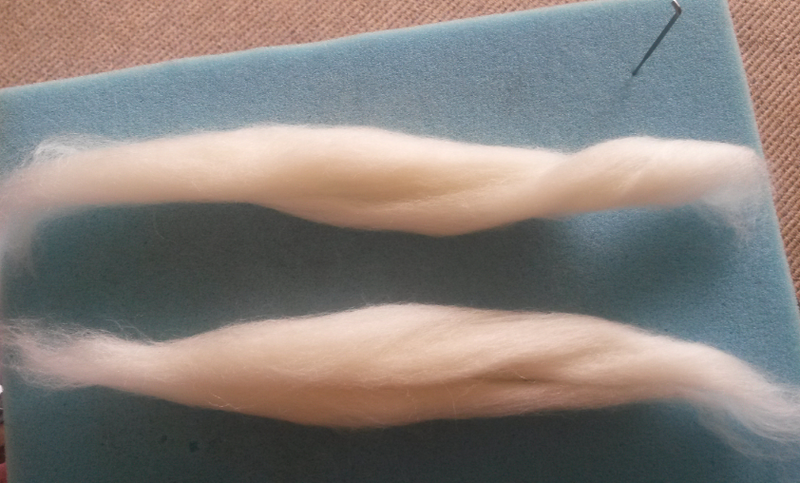 Step 1: take two equal lengths (and density) of your core wool (corriedale in this case). Bear in mind that you will need the two ears to end up the same size so keep comparing them. I find it works better if I do a bit on one then do a bit on the other as I go along rather than finish one and then start the other afterwards. Step 4: now you have a basic flat shape you need to make it more 3d and ear-like so roll the sides in to form thicker edges and stab at 90 degrees but also inwards at an angle keeping the edges rounded where the ear edges need to curve. Do this on both ears as you go..
…. 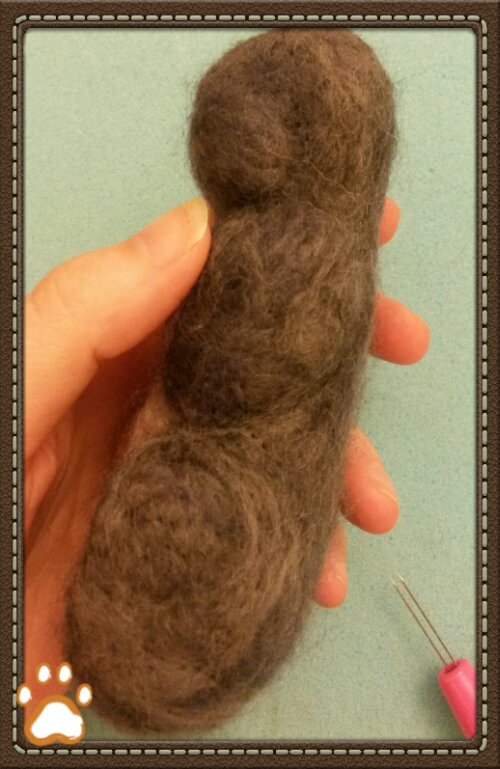 remember to turn your work and use various angles to insert your needle/s to mould the wool into the desired shape. 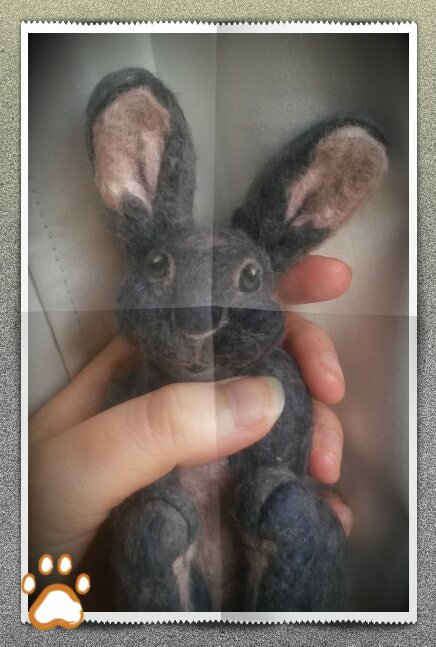 Step 7: Keep felting and keep checking your photo or drawing to see how big the edges are and which areas should be flatter. 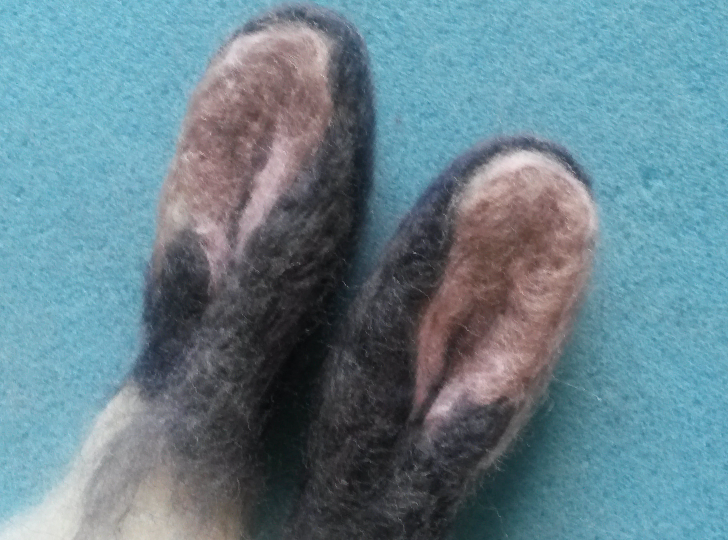 On a real bunny one edge of the ear is thicker than the other so I had to make sure this was the opposite way round on the other ear (as it is in real life) for a mirror effect. You may want to use one needle or just two needles to make more defined lines.. 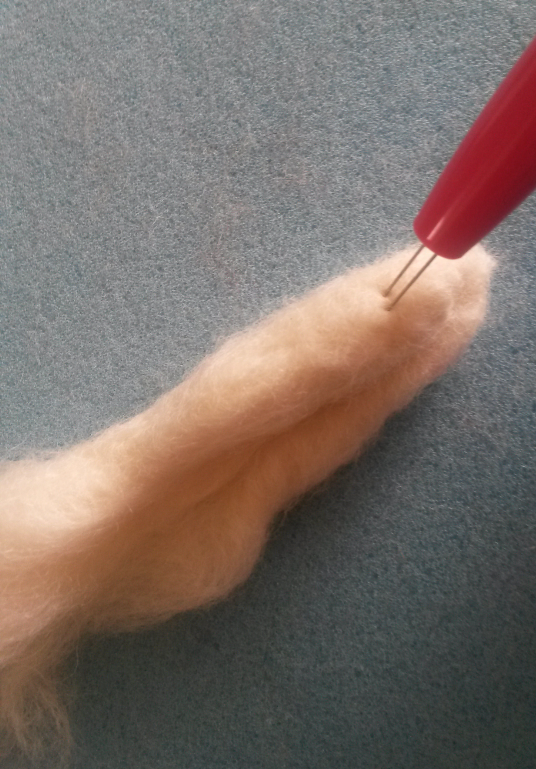 So then comes the exciting part …..have your finer needles and bunny fur colours at the ready for the final step…. 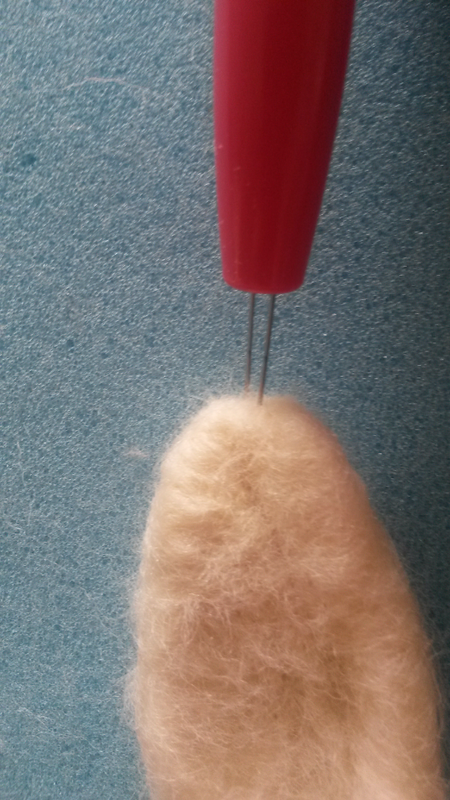 Step 8: carefully shallow felt the ears with your coloured merino wools (just to a depth of first 1 or 2 barbs on your finer needles) to fix the wool in place but not allow the wool to go through to the other side. You don’t want the darker colours to be seen through the lighter colours on the other side! and vice versa (it would be a medley of pink and grey in this case). 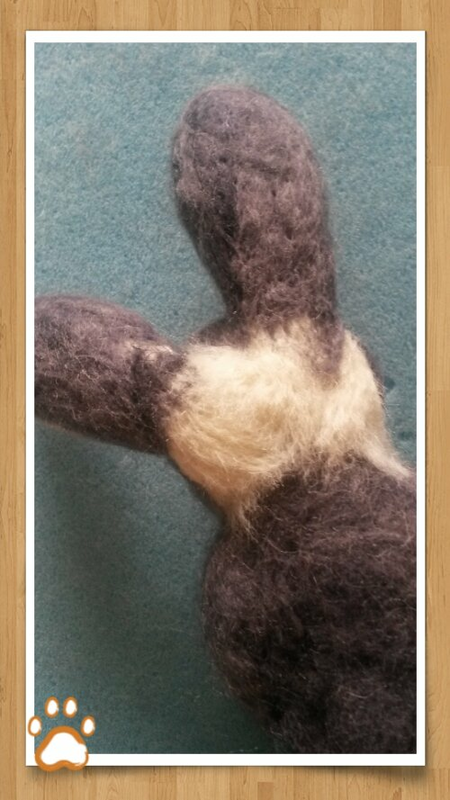 Then your ears are ready to fix on to your bunny head for full bunny character!! I hope you found this useful. Let me know what you would like me to write about and what you would like me to make! 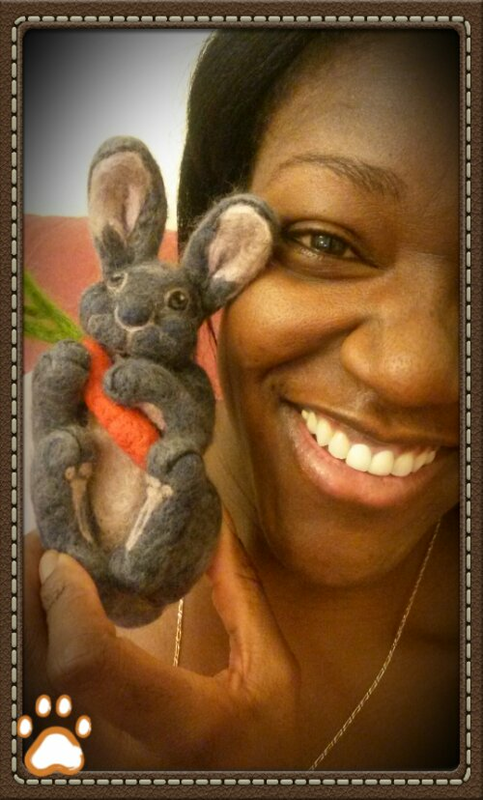 My next post will be a photo gallery of how I made my bunny creation from start to finish….so you will get to see me fixing the ears in place…! 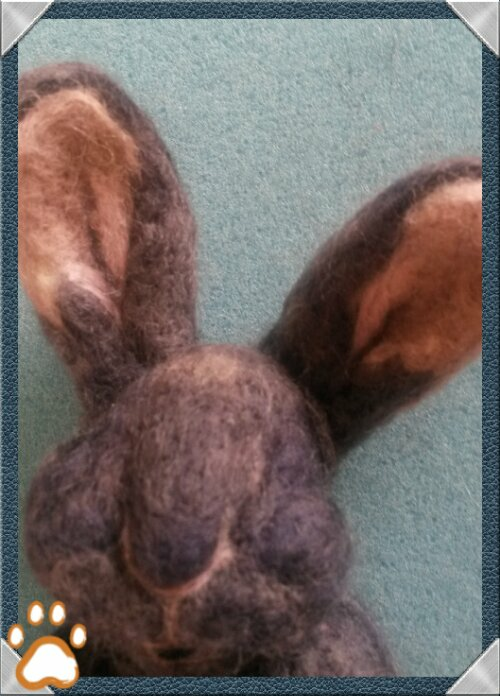 Posted in Needle felt and tagged animal, animal ears, bunny, Bunny ears, ears, Easter, felt, felt ideas, felted, felted ears, felting, handmade, needle, Needle felt ears, Needle felted animal, needlefelt, Spring, wool. Bookmark the permalink.